PHOENIX — For the first time in nearly two months, the New York Mets have won two in a row. Reyes scored on Jose Bautista‘s pinch-hit double that glanced off right fielder Jon Jay’s glove to cut the lead to 3-2. Nimmo, who doubled and scored in the first inning, followed with a two-run shot to right field to put New York ahead 4-3. “When I came up to bat I was just looking to put the barrel on the ball. He’s on second base. A base hit ties it,” Nimmo said. “For me, personally, and for this team, maybe we’ve been trying to do a little too much lately, so there I was just trying to get the barrel on the ball. Cabrera’s solo shot made it 5-3. Alex Avila reached to start the Arizona ninth when first baseman Dominic Smith dropped second baseman Cabrera’s throw for an error but Robert Gsellman retired the next three for his third save in seven tries. David Peralta doubled in Arizona’s first run in the two-run fourth inning and made a diving grab in left field to rob Zack Wheeler of a hit to end the fifth. Jake Lamb’s bloop single in the eighth made it 3-1. Nimmo led off the game with a double, took third on a ground out and scored on Todd Frazier‘s sacrifice fly to center. 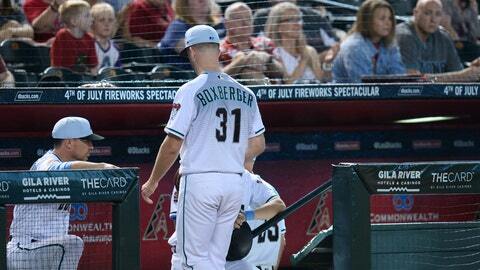 Diamondbacks RHP Shelby Miller (Tommy John surgery) made his fourth rehab start on Saturday night. He threw 6 2-3 scoreless innings for Class A Visalia against San Jose. Miller allowed three hits and struck out 10 with no walks. He threw 81 pitches, 56 strikes. 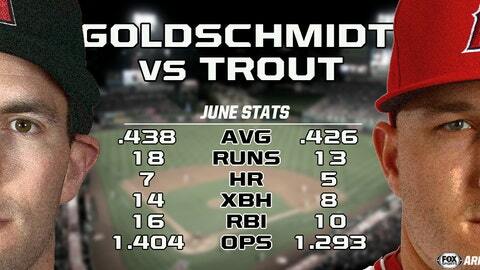 Arizona heads to Anaheim for a two-game interleague series with the Angels. RHP Zack Greinke (5-5, 3.87) starts for the Diamondbacks in Monday night’s opener.